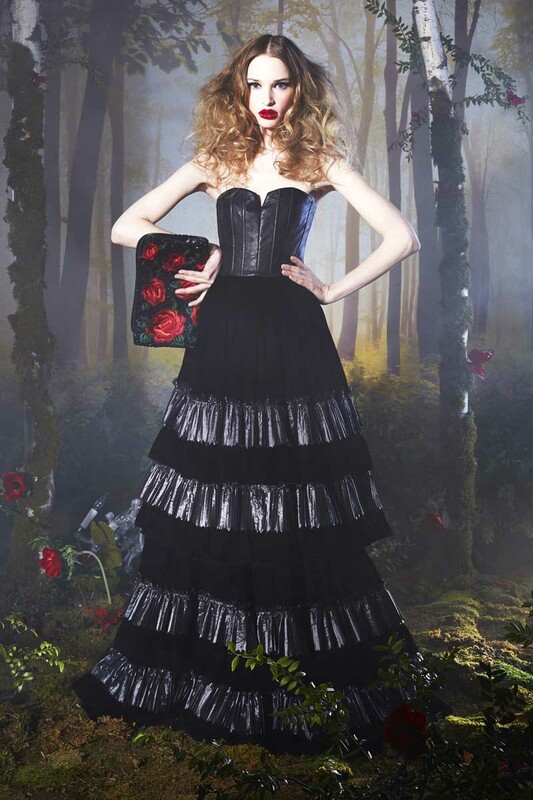 Unveiled last February 10, 2014 in New York, Stacey Bendet’s Fall 2014 collection for alice + olivia is, “Enchanted: A Midwinter Night’s Dream”. Sharp tailoring combines with vintage Victorian charm and bohemian beauty, creating a free-spirited decadence. Suffused with luxe modernity, the collection features bold brocades, rich velvet, regal lace and opulent metallics, mixed with monarch butterfly motifs. Dreamy prints on tapestry fabrics are adorned with fine filigree amid jewel-toned blue, green and “royal red”. Metallic is the new black, while camel, cream and chocolate serve as a rich neutral base. Romantic collars, lace blouse details, ruffled sleeves and chokers are paired with ultra-miniskirts, slouchy menswear-inspired pants and the new fitted denim trouser – a juxtaposition of the past and the present. Fall 2014 introduces several strong silhouettes including the winter short, tailored flair back jacket, crop jacket and statement coat. Novelty knits add fanciful appeal, and blanket knit coats make for cozy toppers over whimsical printed dresses. Fall 2014 accessories feature the NYC boot and pump with signature red tread, and novelty bags including the “Owl bag”, “Bear bag” and “Bride clutch”. Long zippers add edge to thigh high boots, while Victorian-inspired belts and chokers accent RTW looks. All-over crystal embellishment, velvet, fur and caviar beading appear throughout for a touch of luxury. The eye-catching Makayla shoe in mirror marble leather and beaded lace-up ankle booties provide a perfect counterpoint to the more romantic collection offerings.